The XE-2000 atomizing fan units can handle a variety of indoor/outdoor humidification or evaporative cooling applications. The nozzle-free fans can atomize ordinary water supplies into a very fine mist-like fog. 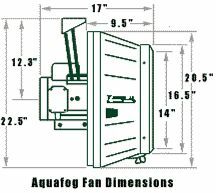 Utilizing high-speed centrifugal force and powerful air flow, these units can propel a misty-fog stream up to 35 feet away. Units can be gravity-feed and are very resistant to acidic chemicals when used in fumigation applications. Widely used in mid-large scale commercial and industrial applications to humidify or evaporative cool large air spaces, but also ideal in spot cooling applications for example; employees working near incinerators, brick ovens, foundries etc.. Uses ordinary water and power supply to produce high quality, high volume fog. Fans can be stationary or equipped with oscillation. Excellent for safe, effective chemical fogging. Used for liquid pesticide and fungicide application, insecticide use and foliar feedings. Capable of continuous duty operation. ****XE-2000 Fans are standard-equipped with a dark teal housing and a dual voltage, white epoxy painted wash-down-duty™ (WDD) motor 115/230V, 1ph, 60Hz. See “Motor Option” below for other motor options. Turbo XE Oscillator The sweeping action of a Turbo XE Fan not only alleviates droplet collisions and fallout, but also enhances air circulation. The dwell-free movement provides for uniform coverage patterns up to 70 feet in diameter. The steady, continuous movement allows the operator to fog at higher output levels over a stationary unit operating under equal conditions, resulting in less fall-out and improved dryness underneath the fog pattern. Humidistat ControIf your humidity requirement is 80% or less, the Humidistat Control is the best choice for control of your environment. When the humidity level drops to about 6% below the set point, the humidistat will activate the Turbo XE Fan to replenish the loss of humidity. If ventilation occurs, humidity can be restored with evaporative cooling. Humidistat ControExcellent for controlling long operation cycles, Often the choice for applications when humidity is desired above 80%. Using extended cycle operation, the operator can attempt to control humidity levels utilizing manual control of the flowmeter panel. Time cycles as short as 1 hour. Two sets of on/off trippers provided. Thermostat Control 1If your main interest is evaporative cooling These watertight thermostats will provide accurate measurement of the temperature, automatically controlling your Turbo XE Fan(s) at approximately 3°F above and below your desired set-point. Thermostat Control 2If your main interest is evaporative cooling, These watertight thermostats will provide accurate measurement of the temperature, automatically controlling your Turbo XE Fan(s) at approximately 3°F above and below your desired set-point. Two-Stage ControlEnvironmental control for high humidity applications and changing temperature conditions. Designed for the greenhouse propagator, these systems can be set to automatically increase fog output when ventilation occurs. Stage one fogging output is controlled by the Timer and Stage two (increase fogging output) is controlled by the Thermostat. Pocket Thermohygrometer: This precision hand-held thermo/hygrometer is ideal for monitoring Humidity and Temperature levels. Accuracy ±3% of measurement with a fast 60 sec. response time.